With This Exclusive FIRST-EVER Silver Commemorative Release! At Pope John Paul II's funeral, the huge crowd gathered in St. Peter's square at the Vatican began chanting "Santo subito! "-Sainthood Now! Today, the dreams of those and millions of faithful around the world are realized with the canonization of Saint John Paul II. Now, you and your family are invited to celebrate this momentous event with an exclusive first-ever one-ounce silver commemorative honoring Saint John Paul II. He Changed the World and Blessed the Church with a Renewed Reverence. As a young priest in Poland, John Paul experienced the brutal reality of communism first hand. When Poland began to throw off the iron fist of tyranny, he supported the effort that led to the end of the Cold War and the liberation of countless millions of souls in Europe. Now, Saint John Paul II officially joins the ranks of the Saints. From his lofty station, he will continue to shower his blessing and guidance on those below. In anticipation of his continued favor, many are searching for a way to honor and commemorate Saint John Paul II. 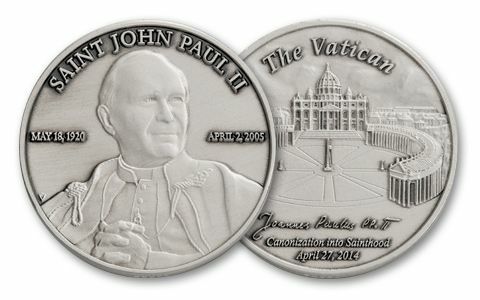 Now You Can Secure Your Own Silver Legacy of Saint John Paul II! 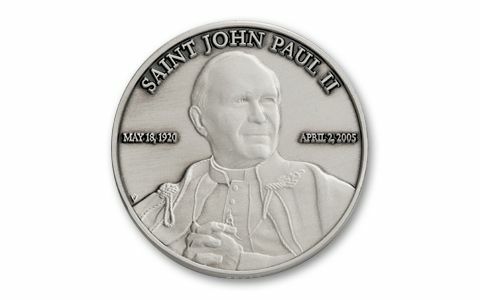 Today, we are pleased to announce the release of our very first-ever Saint John Paul II Silver Commemorative. 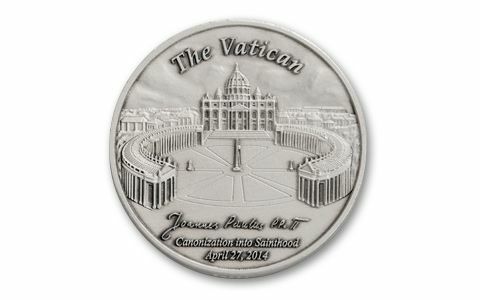 This special minting shows an intricately engraved and detailed image of John Paul, as well as the Bernini Plaza at St. Peter's Basilica in the Vatican - along with the historic date of his canonization. Each is struck to a dazzling Brilliant Uncirculated condition in one-ounce of pure 99.9% silver. The life-like details are stunning! Your commemorative comes in a presentation box accompanied by an official certificate of authenticity. Only 25,000 of these one-ounce silver commemoratives will ever be struck.